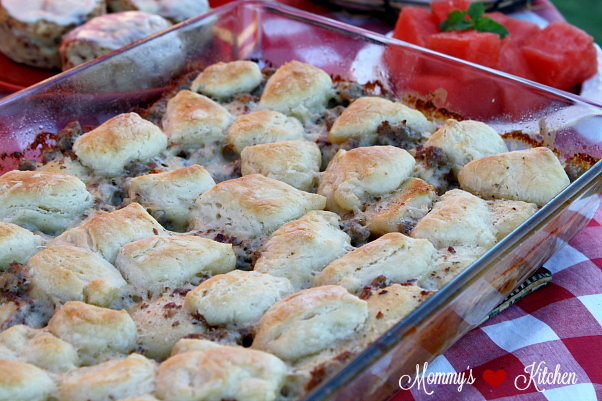 A hearty biscuits and gravy casserole that's a huge crowd-pleaser and perfect for guests. Raise your hands if you love homemade biscuits? I for one love big, tender, fluffy buttermilk biscuits, slathered with apple butter, honey butter or peach preserves. They're also perfect for sopping up milk gravy, sausage gravy, bacon gravy and even chocolate gravy. Goodness, there's nothing better than a good ole fluffy biscuit if you ask me. I grew up eating Southern biscuits, so it's no surprise when you see biscuits gracing my table for breakfast, lunch or dinner. Some things in life are made to be simple and biscuits are one of those things. Every Southern cook knows the secret to perfect biscuits is WhiteLilyⓇ Flour. 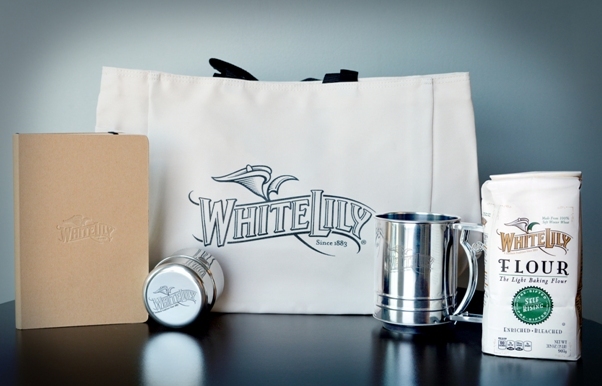 White Lily is popular in the South, and has been helping Southern cooks create the lightest-fluffiest biscuits, baked goods, cakes, cookies and more for generations. I remember my grandmother using White Lily Flour so I know it's good. Why is it so good? Well White Lily Flour is milled from 100% soft red winter wheat and has a low protein and gluten content. This is what makes White Lily so light and silky soft. I love the self-rising flour and it's the only flour I use when it comes to biscuit making. 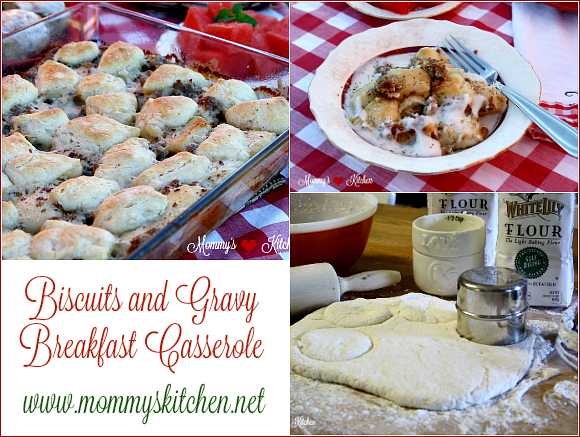 Since it's National Biscuit Month and I love biscuits today I'm sharing this easy breakfast casserole with you. What's better than a homemade buttermilk biscuits, a Biscuits and Gravy Casserole with homemade buttermilk biscuits!!!! 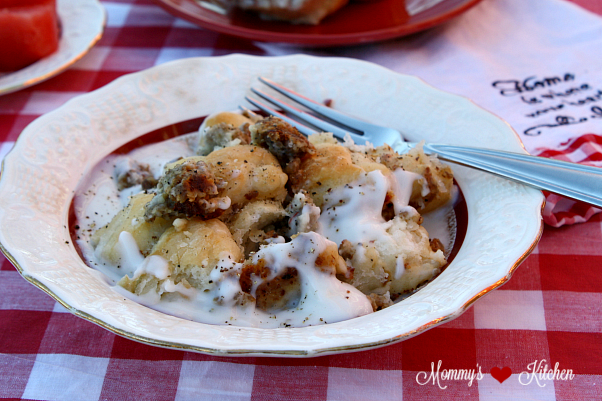 This casserole has all the ingredients of traditional biscuits and gravy all rolled into this easy casserole. I've seen a few recipes online, but most of them use canned biscuits, but homemade biscuits are really simple to make and taste so much better. Trust me on this one. Mercy this breakfast casserole was so good and everyone loved it. This hearty biscuits and gravy breakfast casserole is a huge crowd-pleaser and perfect for overnight guests. Let's get started on the recipe. Preheat oven to 375 degrees. In a large bowl add, the flour and shortening. 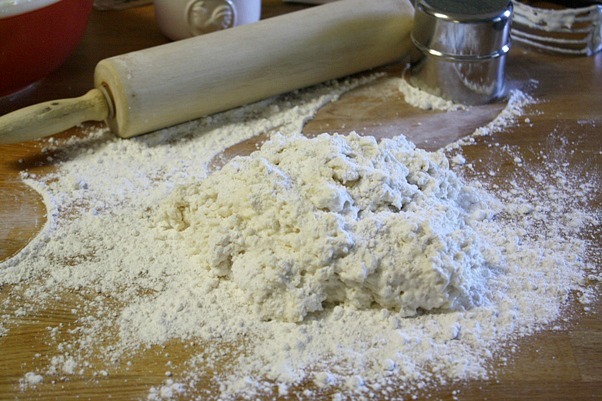 Using a pastry blender or a fork cut the shortening into the flour until it resembles crumbs. Add the buttermilk and stir well. 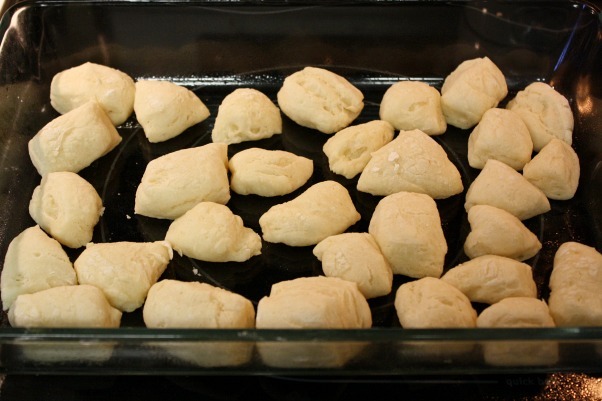 Turn the biscuit dough out on a floured surface and lightly knead and fold the dough until it is no longer sticky. Sprinkle a bit of flour on the rolling pin and roll out the biscuit dough. I roll my biscuit dough to about 1 inch thick (I like higher biscuits) but for this recipe 1/2 inch in perfect. Using a floured biscuit cutter, cut out 9-10 biscuits and set the biscuits aside on a baking pan until all the biscuits have been cut. Using kitchen shears, cut each biscuit into 6 pieces and line half of the biscuits pieces in the bottom of a 13 x 9 inch baking pan that has been sprayed with non stick spray. Bake the biscuits for 10 minutes. While the biscuits bake, prepare the sausage gravy. 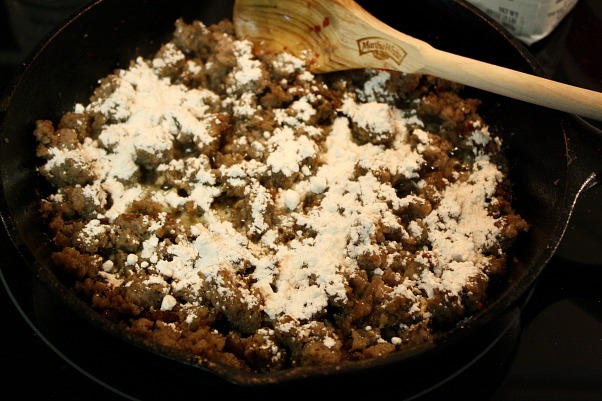 Crumble and cook sausage in a large skillet over medium heat until browned. Stir in the 1/4 cup flour and mix until dissolved. In a large measuring cup combine the water and the milk together and slowly stir it into the sausage mixture. Let the sausage mixture come to a light boil and then reduce and simmer until slightly thickened (you want the gravy a bit thin because it will continue to thicken as it bakes in the oven). Remove from heat and add salt and pepper, to taste. Take the baking pan out of the oven and pour the sausage gravy over the bottom layer of cooked biscuit pieces. Layer the remaining uncooked biscuit pieces on top of the sausage gravy. Bake for 15 - 20 minutes or until the biscuits are golden brown. Remove from oven and brush a bit of butter on top of the biscuits and serve warm. Preheat oven to 375 degrees. In a large bowl add, the flour and shortening. Using a pastry blender or a fork cut the shortening into the flour until it resembles crumbs. Add the buttermilk and stir well. Turn the biscuit dough out on a floured surface and lightly knead and fold the dough until it is no longer sticky. 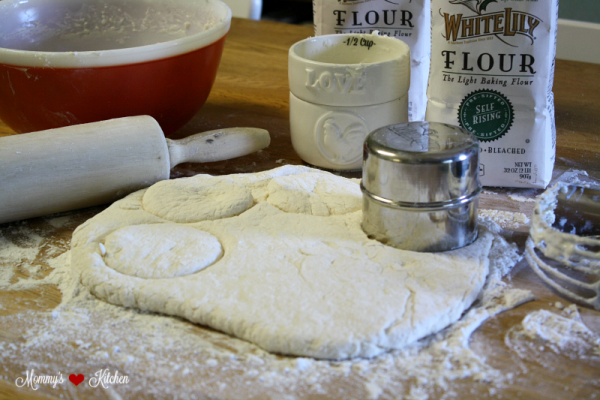 Sprinkle a bit of flour on the rolling pin and gently roll or pat the biscuit dough. I roll my biscuit dough to about 1 inch thick (I like higher biscuits) but for this recipe 1/2 inch is perfect. Using kitchen shears, cut each biscuit into 6 pieces and line half of the biscuits in the bottom of a 13 x 9 inch baking pan that has been sprayed with non stick spray. Bake the biscuits for 10 minutes. While the biscuits bake, prepare the sausage gravy. 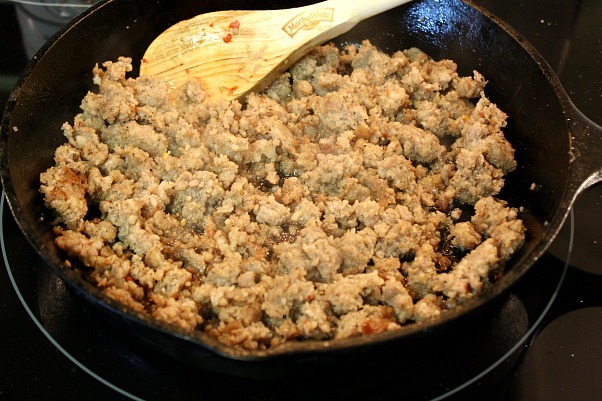 Crumble and cook sausage in a large skillet over medium heat until browned. Stir in 1/4 cup flour and mix until dissolved. In a large measuring cup, combine the water and milk together and slowly stir it into the sausage mixture. 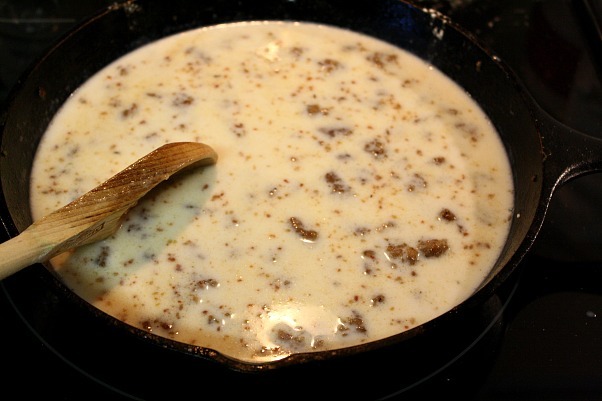 Let the sausage gravy come to a light boil and then reduce and simmer until slightly thickened (you want the gravy a bit thin because it will continue to thicken as it bakes in the oven). 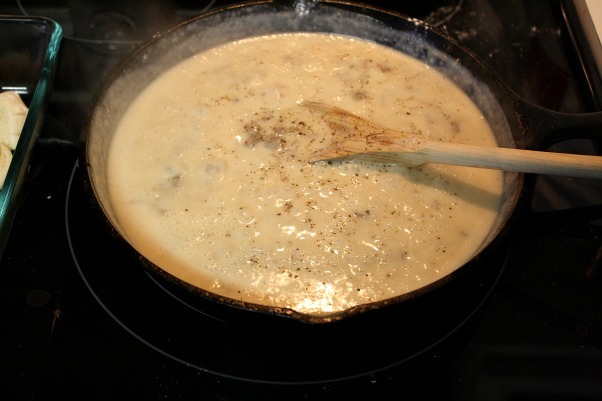 For a thinner gravy use more milk. Remove from heat and add salt and pepper to taste. 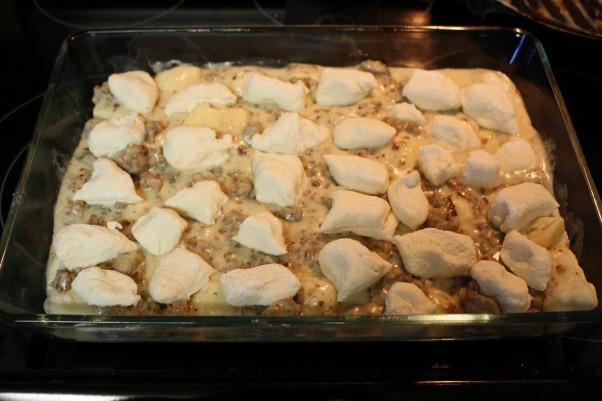 Remove the baking pan from the oven and pour the sausage gravy over the bottom layer of cooked biscuit pieces. Layer the remaining uncooked biscuits on top of the sausage gravy. Place the baking pan back into the oven and bake for 15 - 20 minutes or until the biscuits are golden brown and cook through. Remove from oven and brush a bit of butter on top of the biscuits and serve. Cooks Note: If you have trouble finding White Lily Flour in your area, you can purchase it online at Soap.com. I get mine on soap.com (2 - 80 oz packages for $8.79). If you live in Texas White Lily Flour can be purchased at HEB Grocery or at Central Market. In celebration of National Biscuit Month the nice folks at WhilyLilyⓇ, are giving one Mommy's Kitchen reader a chance to win a White Lily Prize Package!!! This gift package will include everything you need to bake up the best Southern biscuits. Enter the giveaway using the Rafflecopter entry box below. For more Southern deliciousness, visit WhiteLily.com and follow along on Pinterest and Instagram! I enjoy your recipes, the prize pack looks beautiful. No doubt about it, I am a gravy and biscuit girl. Love all kinds of gravy (sausage, chicken, bacon, etc.). Without an amazing fluffy biscuit though, it is nowhere near as good. Thanks for the opportunity to enter your giveaway! I love biscuits and gravy but also love a warm biscuit with butter and jelly. My father loves biscuits, so on holidays I make both yeast rolls and biscuits. My favorite way to enjoy biscuits is to watch my father enjoy them. I love biscuits anyway....especially sopping up egg yolks and with milk gravy. My favorite way is with butter and wild sand plum jelly. Well maybe not, covered in sausage gravy is a favorite also! White Lily makes the best biscuits! I love their recipe for cream biscuits. I think my favorite way to eat one is hot out of the oven with butter and blackberry jelly. Yum! Either with gravy...or with butter and honey! While I do love biscuits and gravy - my heart belongs to a hot buttered biscuit slathered with honey. Yum! Thanks for the chance to win! These look marvelous--would love to try the flour! Looks delicious! 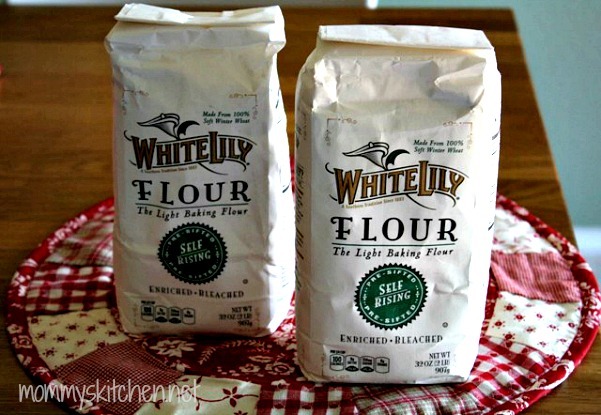 I love White Lily Flour! My favorite way to enjoy biscuits is with thick Sausage Gravy & lots of hot sauce!! I've been making biscuits and gravy since I can remember. I like to serve biscuits with smothered pork chops or use them as dumplings in chicken and dumplings. Or to sop up red-eye gravy. Yummy! I can't believe how delicious that looks! YUM! Gosh those biscuit rounds look perfect and the casserole looks very yummy. I love your homemade bread recipes. They are the best ever. I am so happy you showed us a homemade recipe rather than using canned biscuits or prepared products. Please publish more like this!!! Thank you! 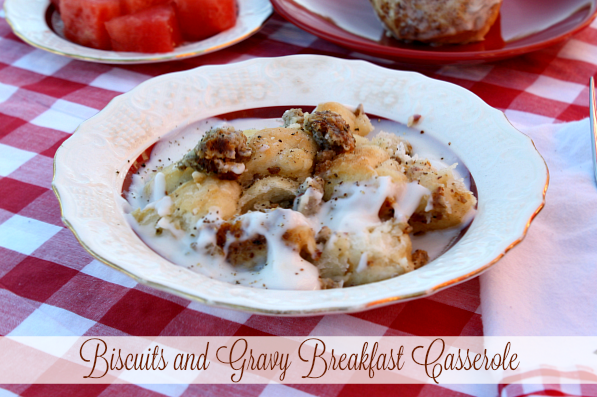 We love bisquits and gravy casserole with eggs and cheese in it also. I know my family would love this! Biscuits & Gravy is one of our favorites. Biscuits and gravy are my fav! We love biscuits, think our fav would be biscuits and gravy tho! I'm anxious to try the casserole recipes you shared! I love biscuits and way you fix them. Plain with butter or honey or jam. With thinly sliced country ham. With egg and cheese for a breakfast sandwich and of course biscuits and gravy. I am going to try that casserole. It looks so good! We used White Lily flour at our restaurant we had for five years. We always received compliments on our light flaky biscuits. I love biscuits just about anyway, but my favorite is to open one up and put a layer of scrambled eggs and then ladle it with sausage gravy...for the other half, I put butter and jelly on it. My kids say "it's all about the layers, hehe! Thanks for always making something amazing in your newsletters, favorite biscuit is pretty simple one hot from the oven brushed real butter & covered in homemade strawberry jam (now if you'll excuse me I gotta turn on the oven). This recipe sounds wonderful! I am definitely going to give it a try. Have you ever tried making Biscuits and Gravy with evaporated milk? That's the way I have been making it for years and it is the best gravy ever! I also love Chocolate Gravy and Biscuits, but I didn't know that anyone else made it. I'm glad to hear I am not alone. Nothing is better on a cold night than a meal of biscuits slathered with butter and chocolate gravy on top. Great tutorial! I felt nostalgic after I read your post. I used to do this when my sister decided to put up a business in baking. It was long time ago and I actually enjoy making shapes for biscuits. The one you did looks like another sweet biscuit. Would love to try this once I have the chance. I love biscuits and gravy and your recipe looks amazing. My family could eat breakfast for dinner on a daily basis. When we do though, its always delicious biscuits and gravy and scrambled eggs. Biscuits and Gravy always make me so happy. We have gone to several restaurants just to sample their biscuits and gravy. Love this recipe and I will have to share with my husband.